(January 24, 2019)… The Rochester Knighthawks announced today that the organization will retire former forward John Grant Jr.’s No. 24 jersey on Saturday, Feb. 2. Grant’s jersey will be raised to the rafters prior to the game against the Georgia Swarm at 7:30 p.m.
It’s fitting that the man who rewrote the team’s record book becomes the first player in franchise history to have his number retired. In doing so, the franchise’s all-time leading scorer will also become the 18th member of the Knighthawks Hall of Fame. Grant spent 11 of his 18 years (2000-10) in Rochester after the Knighthawks made him the first overall pick in the 1999 National Lacrosse League Entry Draft. The Peterborough, Ontario, native was a lacrosse prodigy, as the son of lacrosse icon John Grant Sr. Even before ‘Junior’ stepped on the turf for his first NLL game, he had already achieved legendary status for his exploits with the hometown Lakers and the University of Delaware Blue Hens. Longtime Knighthawks’ captain Regy Thorpe said it was evident from the first day that Grant was going to be a special player. During the 2000 season, Grant began his future Hall of Fame career with a bang, leading Rochester in goals (37), assists (40) and points (77). For his exceptional play, he was voted the 2000 NLL Rookie of the Year and became the first rookie since 1991 to earn First Team All-Pro honors. He also helped the Knighthawks return to the NLL Finals. In the title game, Grant scored an incredible behind-the-back goal in the closing minute to tie the game against the Toronto Rock. He finished the contest with four goals and four assists to lead Rochester with 15 playoff points in two games. To those who scouted him or played alongside him, it was no surprise that he had an immediate impact in his rookie campaign. Grant’s inaugural campaign was a sign of things to come. Nine times he led the team in goals and points. In the other two seasons, he did not finish first on the team in both offensive categories due to injuries. With Grant in the lineup, Rochester advanced to the playoffs eight times and made three trips to the NLL Finals (2000, 2003 and 2007). While wearing the Purple and Teal, Grant was a five-time First Team All-Pro (2000, 2001, 2005, 2006, 2007) and a two-time Second Team All-Pro (2002, 2003). He was also a four-time team MVP and the 2007 league and Championship Game MVP. Despite the long list of accolades, Grant was more concerned with winning than any individual recognition. His drive and focus in practice and during games made everyone around him play at a higher level. The pinnacle of Grant’s career was in 2007 when the perennial All-Pro brought Rochester its second NLL title. He was an offensive force that year, leading the league with 51 goals and 111 points. He also posted a then-franchise record 60 assists. That year, Grant became the first Knighthawk to lead the league in points and win the NLL MVP award. He was the alternate captain of a team that set a league record by winning 17 straight games. After starting the season with a 2-2 record, the Knighthawks ended the regular season with 14 consecutive wins. Rochester then won both playoff games, which included a 13-11 win over the Arizona Sting, en route to the NLL Cup. One such comeback was in the 2007 East Division Finals against the rival Buffalo. After rallying from a three-goal, fourth-quarter deficit, Grant scored 26 seconds into overtime to give Rochester a 14-13 victory and a trip to the NLL Championship Game. Grant completed his stint in the Flower City as the franchise’s all-time leader in goals (433) and points (894). The highly-touted forward also posted 461 assists to finish second in that offensive category. The University of Delaware product also resides at the top of the list for postseason goals with 47 and is second in playoff points with 82. In July of 2017, Grant officially retired from professional lacrosse, concluding his career as a two-time NLL MVP and nine-time All-Pro. He wrapped up his playing days with the Colorado Mammoth to finish with the second most goals (668) and points (1,446) in league history while placing fifth in assists (778). 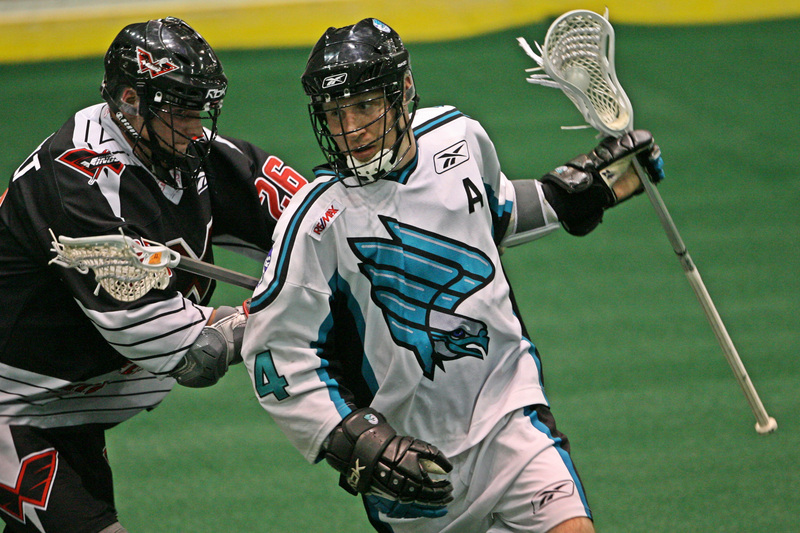 Recently, Grant was named to the Knighthawks’ All-Time Team as the top vote-getter. Despite last wearing the Rochester sweater in 2010, he remains a fan favorite because of his contributions on and off the field. Grant did what few players have done; he moved to Rochester to become part of the rich-lacrosse community. While he was winning awards and scoring titles early in his career, he was also working as the lead instructor at camps and clinics, and playing in men’s league games at Total Sports Experience. The forward also made time to visit lacrosse practices, hospitals and local schools, which earned him the team’s Community Service Award three times in his 11 years with the organization.